Welcome to Cancun’s Newest Oceanfront Amusement Park! Wet ’n Wild is a waterslide park with plenty of fun & exciting water activities. If you’re looking for adventure go to Aaa! where you’ll find thrilling activities like ziplines and bungee swings. Those with young children are going to love Fun World’s child-friendly activities. Grand Prix puts you and your family behind the wheel at a beautiful seaside go-kart track. Get a glimpse of the future with Underworld’s entertaining arcade that features state-of-the-art activities like Virtual Reality. And Dolphinaris is Cancun’s #1 option for memorable dolphin swims. When you come to Ventura Park, be sure to bring your bathing suit no matter what season it is! Wouldn’t you like to enjoy the world-famous Wet’n Wild Waterpark? It features a variety of exciting water-slides, like the 4 person Bubba Tub or comforting the Lazy River inner-tube float. But it’s not just waterslides & inner tube floats. There’s also an artificial wave pool (technology is fun isn’t it?). And for young children, there’s a water playground called Kid’s Park. Are you ready for an adventure? 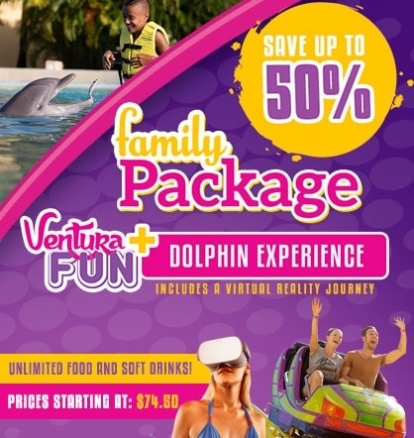 Because at Aaah!Ventura you and your family can simulate a flying experience with a 3 zipline circuit. Or you can do your best Tarzan impression with a bungee swing. Test your fear of heights with the Heli-Jump, a free-fall station. Or traverse over a high-hanging aerial bridge, Skywalk. Still feeling courageous? Try Step-Up, where each step increases the height—and tension. Have an adventure your whole family will enjoy at Aaa!Ventura. Bringing the little ones with you to Cancun? Then they’re going to love Fun World. Here, you can relive your childhood and share with your child the same activities you enjoyed earlier in life. Expect to find entertaining kid-friendly activities like a small roller-coaster, merry-go-round, crazy chairs, and kid’s playground. Visit Ventura Park to find the only place in Cancun that has this many fun activities specifically geared for young children. 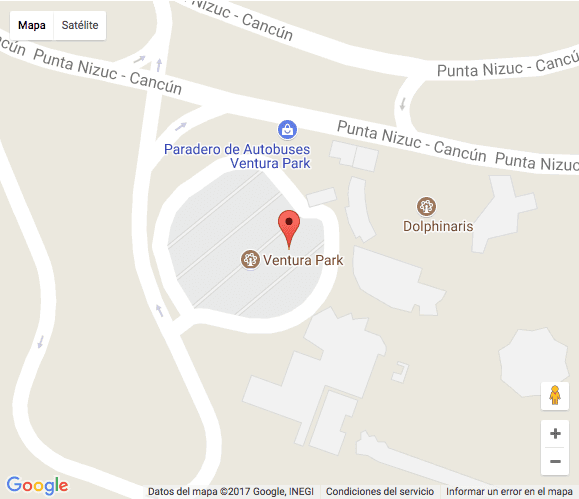 Looking for a futuristic arcade in Cancun? You’re in luck. Because Ventura Park’s Underworld is exactly that. Here you’ll find state-of-the-art technology like virtual reality games that let you explore a different world. There’s also a Star Wars Battle Pod that recreates the epic races from the classic thrilogy. Don’t forget to check Laser Tanks (think laser tag meets bumper cars) or The Mission, a laser labyrinth. Want to drive go-karts in Cancun? Then try Ventura Park’s, Grand Prix beautiful seaside go-kart track. This entertaining 275-yard track allows you to speed around at 25 mph. You can even ride in a double go-kart so dad/mom can bring the little one along. Or maybe you have a youngster who’d like to show you what they can do behind the wheel. You know? Earn some family bragging rights. It’s fun for the whole family! At Ventura Park you have these mouth-watering options that are included in your admission like Sunrise Food Court, The Wreck Snack & Bar, River Bar, and Funny Bar. Also, there are other various premium options (not included in admission) like Buon Appetito, The Bunker, La Cevicheria, el Ice Cream Bar, and EL BEACH OH! Club (subject to availability). Dine at these delicious eateries, then get back to the fun! All alcoholic beverages are charged separately. There’s always something fun & entertaining to do at Ventura Park. For example. Have you ever seen animals from the jungle? At Amazonia you can see exotic creatures like a toucan, cockatoo, a boa-constrictor and much more. Or, you and your family can relax at EL BEACH OH! Club (subject to availability), and enjoy luxurious bedside food & drinks service. Extra options include towels, lockers, single inner-tubes for the Lazy River & Wave Pool, Ice Cream Parlor, & Open Bar.